CIRCA 1950'S. LAMP FEATURES THE ORIGINAL WHITE MILK GLASS HOBNAIL GLOBE WITH FLUTTED/RUFFLED TOP AND BALL AT THE BASE OF THE LAMP WITH CLEAR INNER HURRICANE VASE THAT FITS OVER WHERE THE LIGHT BULB SCREWS INTO THE LAMP. Hello everyone. Here I am proudly presenting a gorgeous PAIR OF SWATER TUMBLERS/GLASSES in theHOBNAIL pattern in the" crystal and white opalescent " color. TheHOBNAIL pattern was produced byFENTON ART GLASS CO.
Vintage Fenton milkglass hobnail stein/mug/vase. This piece stands 6 3/4 inches tall. Also in very excellent condition with no chips or cracks. Has the fenton logo embossed on the bottom. This piece would make a great addition to a collection or use it for years to come. Get this lovely Fenton Hobnail Milk Glass Set. Blown glass is highly collectible. This is winter white. Vintage FENTON HOBNAIL MILK GLASS Water Tea Pitcher 64 Oz. & 4 Tumblers 8 Oz. Vintage FENTON HOBNAIL MILK GLASS Water Tea Pitcher 64 Oz. & 4 Tumblers 8 Oz.. in good condition with normal wear for age. Shipped with USPS Priority Mail. Buyer pays shipping, no returns. It is a Fenton product, although unmarked, circa prior to 1974. Unseen when displayed on the wall. Unique yet very Elegant & Modern design wall pocket. Silver tone spigot is only for admiring. It being white allows you to alternate the floral design with ease. Fenton designed this bottle for Wrisley's "Lily Of The Valley". Next item is a small Fenton art glass ruffle basket. Fenton white hobnail covered candy dish. I will work very hard with you to resolve the problem. I will be happy to work with you to resolve problems with your sale. Each horn is 8.5" high. Total height of piece is approx 10". It is a classic type, made of milk glass with a ruffled edge. It features a hobnail decoration all around with rope designs interspaced. It's in great condition. It's about 2.5" deep. No issues with glass- excellent condition. Vintage Fenton White Hobnail Milk Glass Vase 9-1/2" high 4" base NICE!!! Has been displayed. This is older than when Fentom started stamping their pieces so I'm unsure on its age. Very nice addition to your collection or use as a vase. The item pictured is the exact item you will receive. Wonderful Fenton NIB smoking set! Fenton #3603 MI. White milk glass with hobnail design. The set features the following Covered Cigarette Box 8 Rows Hobs #3685. Cigarette Lighter 7 Rows Hobs #3692. HOBNAIL FOOTED VASE. Just stunning. MILK BOTTLE GLASS. I’m sure that when we communicate, we can work things out to everyone’s benefit. Vintage White Moonstone Opalescent Hobnail Vase Antique Vase 50s Shipped with USPS Priority Mail. ~ Vintage Fenton Hobnail Milk Glass Globe with ornamental brass tip. ~ Looks to have been a fixture on a ceiling light or pendant lamp ~ Globe measures approx 7" in diameter and the lip of the opening, (where it would fit into a fixture), is 3 7/8" in diameter - just shy of 4". This fits a standard ceiling fixture from the 1950s/60s (tested it in my vintage kitchen ceiling fixture and it fitted exactly.) ~ Pristine condition with no chips, cracks or repairs. ~ If you feel our price is out of line, please make an offer. 2 unmarked tallest one Imperial Glass. excellent condition. Lot includes - Candle lamp - 6.5" x 3.5", Ruffled bowl - 10" x 4", Candy / compote - 6" x 6", Goblet - 5.5". 4 PC FENTON HOBNAIL MILK GLASS with RUFFLES. "TWO OR MORE OF ANYTHING IS THE START OF A COLLECTION" (H.G.). The vase is in excellent condition. Both are in excellent condition! Compote is: 8" across and 4" tall. Star bowl is: 4 1/2" across and 2 3/4" tall. Fenton Hobnail Blue Opalescent Bon Bon Dish. The two photos showing it next to a 12 oz. soda can are for a visual size reference only. This Fenton hobnail milk glass is sure to make a wonderful gift to someone special. Can hold a small plant, candy or whatever one wants to use it for these days. It's in excellent condition and it has no cracks or chips. Order before Christmas and add it to your loved one's collection., you won't be sorry. 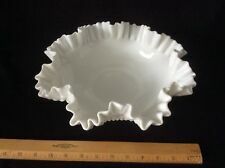 Large 12" Hobnail White Milk Glass Ruffle Edge Bowl Candy Dish. ESTATE SALE / YARD SALE FINDS AND MUCH MORE TO BE LISTED! Mint condition. weighs 2#11 oz. This is a really nice hobnail milk glass ribbon crimped bowl. The milk glass on this bowl is a bright milky white with beautiful shine to it. This is a thick heavy piece; the bowl weighs 12 ounces. One marked Fenton the other unmarked. Feel similar in weight and quality. 4 3/4" tall and 5" tall. FENTON STAMPED MILK GLASS HOBNAIL DEEP CANDY DISH. Wonderful addition for Fenton Collectors. Can be used for dry flowers, candy or other smalls. MINT condition. 4" H x 6.25" W (at longest width on top) 3.5" Depth. Fenton candy dish, bowl, compote. Milk glass hobnail crimped & ruffled bowl compote. Very pretty. 7 1/4" by 3 1/2" high. 3 low toes/feet. Very good condition. You just may find another perfect piece to add to your collection or send as a wonderful gift! Lovely hobnail milk glass piece. Fenton milkglass hobnail ruffled top 8 inch vase. Piece is in excellent condition with no chips or cracks. Great piece to add to a collection or use for years to come. Stunning piece. Epergne Centerpiece Vase. Beautiful 9" tall milk glass bud vase has the black and gold Fenton sticker on the body of the vase. It is Fenton No. 3950 MI. The sticker is faded but the vase is in excellent condition! FENTON White Milk Glass HOBNAIL EPERGNE 3 Horn Ruffled Edges 10" x 10"
Still retains the original Fenton foil sticker. First option listed may not be best option. Pick up also available Columbus, OH area. Both are in very good condition. Size from one to the other varies slightly. Candle is not included.